For University sponsored FSM-related events throughout the semester, go to: http://events.berkeley.edu/index.php/calendar/sn/fsm.html. Events that require registration are starred **. 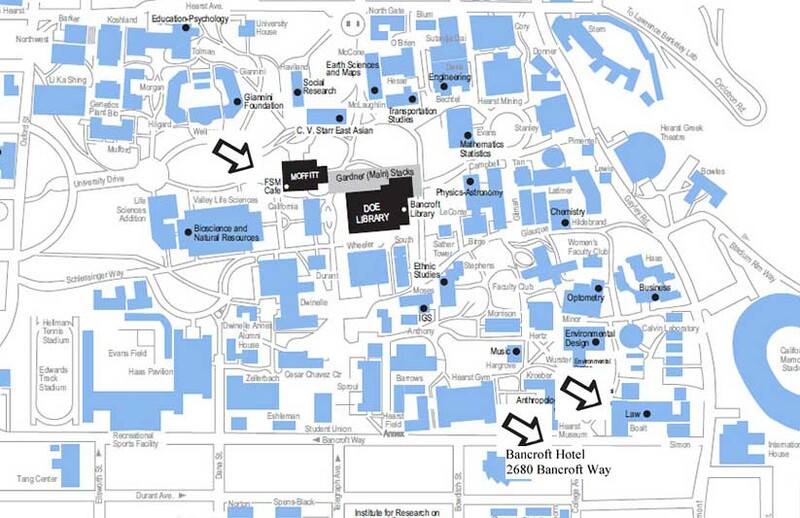 Events held on campus except where indicated. SATURDAY: CHECK the parking signs. Any street that says no Parking on game days, they WILL TOW your car. Carrying It On: Panels, debates and discussions. FREE for reunion registrants, registered students, and low-income. (All others $5 donation) Boalt Hall. 10:30-noon The Right to Vote, the Right to Live: from Selma to Ferguson (Plenary) Booth auditorium. Speakers: Ben Jealous, former CEO of the NAACP, and Martha Noonan, former Mississippi Freedom Summer volunteer, teacher and community organizer. Moderator: Bettina F. Aptheker, FSM Steering Committee, UCSC Distinguished Professor, UC Presidential Co-Chair, Feminist Critical Race & Ethnic Studies. When Values Collide - Room 100. an informal debate about free speech vs. social justice. Moderator: Adam Hochschild, prize-winning author, UC School of Journalism, panelists: FSM vets Paul von Blum Senior Lecturer, African Studies Center, UCLA; and Kathleen Piper, community activist, and Current Cal students. Challenges to Campus Free Speech and Academic Freedom:, Room 100 Moderator, Hertha Sweet Wong, Prof., Dept. of English, panelists Henry Reichman, chair, AAUP Committee on Academic Freedom and Tenure, Celeste Langan, Prof., Dept.of Eng,.Occupy arrestee; Greg Lukianoff, President, FIRE!,(Foundation for Individual Rights in Education) and Yaman Salahi, Asian Law Caucus. ** 8:45-???? Hootenanny and Dance at Ashkenaz, 1317 San Pablo Ave, $12, open to all. Hali Hammer emcees a concert and sing-along with Nancy Schimmel, Country Joe McDonald, Barbara Dane, and Terry Garthwaite plus a Singing Circle (pick your oldie of choice for the group to sing) and post-concert dancing (if we're awake.). Beer, wine, veg. menu available. (no-host). ** 10 am-1 pm Brunch Picnic Potluck: Memorial Glade (just North of Doe Library) (FREE with dish to share) or $5. 4-6 Divestment Revisited: UC Berkeley, the Free SpeechMov ement, and South Africa Divestment Movement Berkeley Art Museum, Gund Theater. FREE, open to all. Sponsored by Center for African Studies. 1:30-3:30 Berkeley Faculty Association Teach-in: The Operation of the Machine: UC Then and Now. Free, open to all. Maude Fife Rm., 315 Wheeler UC Professors Wendy Brown, (Political Science), Tyrone Hayes, (Integrative Biology), Leigh Raiford, (African American Studies), Chris Newfield, Professor, English, UC Santa Barbara; and Amanda Armstrong, Graduate Student, Rhetoric, UC Berkeley will lead a teach-in on the nature of the public university. Looking at the state cutbacks to education funding and the university's increased reliance on private sources, it will examine race and educational access, student debt and rising inequality, the marketization of research, and other pressing issues. 4:30-6 Teaching the Free Speech Movement: a Panel for Educators, 370 G Dwinelle Hall. Robert Cohen, professor of history and social studies from NYU, author of Freedom's Orator, will moderate a panel for educators. Veterans of the Free Speech Movement will share their experiences and thoughts on how to convey enduring understandings and explore the history of this period with K-12 students. COMEDY "MADAME GUFAY'S FREE SPEECH LOVELUTIONARIES" by Norah Foster at 1301 Shattuck Ave. Live Oak Theater. Directed by Alan Barkan. AEB production.